Pioneers in the industry, we offer conductivity meter from India. With the aim of delivering qualitative products, we are engaged in offering our clients with an excellent quality Conductivity Meter. 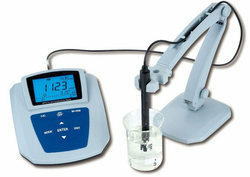 Our offered conductivity meter is developed with basic material and modular tools, under the supervision of our experts. This device is notable for its high-efficiency level and has wide usage for an inline water quality conductivity analysis purpose. Offered meter is used in laboratories to determine the conductivity of the sample. Accuracy: ± 0.3% FS 200µ Mhos/cm 1% FS in last range. 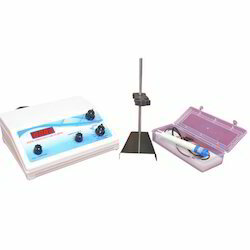 Our organization is highly efficient in bringing forth an astonishing range of Conductivity meter. These meters also come with features of automatic temperature compensation, rugged and splash proof carrying case and fixed 2 % / °C temperature coefficient that makes these instruments deliver the best usage. Further, these units also come with auto power off function that saves power of instrument for a longer time.